COMPLETELY CUSTOMIZABLE AND COMPREHENSIVE YACHT MANAGEMENT PROGRAMS THAT TAKE CARE OF EVERY DETAIL. The logistics of owning a yacht can be an overwhelming; that's where Yacht Management comes in. Our staff will streamline the maintenance, supply, and delivery of all the resources needed to make your experience more enjoyable and stress free. Yacht Management South Florida can take care of every aspect of owning and operating your yacht. Some of our services include mechanical and electrical maintenance, yacht concierge staffing, complete travel planning, and yacht financial management services. We work hard behind the scene, so that you spend more time on the water. From weekly wash downs at your "home dock" to supervising yard time, and even planning your trip itinerary, Yacht Management has your yacht and cruising experience covered 100%. Our location in Fort Lauderdale, Florida, the "Yachting Capital of the World" allows us to access all of the resources necessary for even the most demanding client. We provide owners with more security, enjoyment on the water, and ultimately - peace of mind. Complete yacht management services can be customized to meet the individual needs of all clients, and each plan may be changed at any time. Yacht Management South Florida couples the desires of yacht owners with the manufacturer's recommendations in specific cases where the vessel needs to be properly maintained. 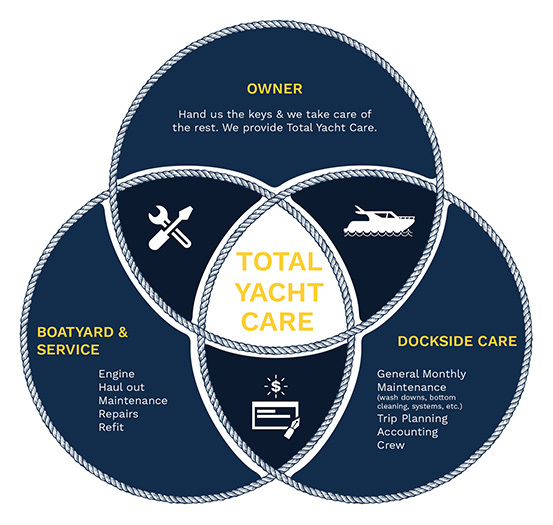 Visit our dockside services page to explore all of the complete yacht management services that we offer. If you have any additional queries regarding our complete yacht management services or would like to inquire about specific or custom services, contact us or call (954) 941-6447. A representative from our team will be happy to meet you and discuss your needs.